The A&P Gypsies was a musical series broadcast on radio beginning in 1924. With the opening theme of "Two Guitars," the host and band leader was Harry Horlick, who had learned gypsy folk music while traveling with gypsy bands in Istanbul. Born July 20, 1896, in Tiflis, Russia, Horlick remained in Russia when his family left for America at the beginning on World War I, and he became a prisoner of war. His family and the American consul helped him get to the United States where he performed in cafés in the early 1920s. 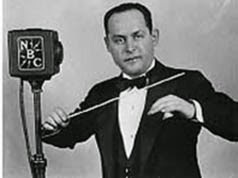 Horlick's six-piece ensemble was playing unsponsored on New York's WEAF in the winter of 1923 when they were seen by a Great Atlantic & Pacific Tea Company executive who was taking a tour of the radio studio. The music group began regular broadcasts, sponsored by A&P supermarkets, on Monday nights, beginning March 17, 1924.